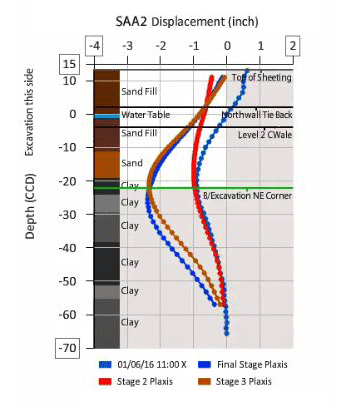 Deformation of diaphragm walls, sheet pile walls, and other earth retention systems. Differential settlements in foundations and structures, especially during tunneling or jet grouting operations. Subsurface movements in landslide areas, highway cuts, and embankments. Convergence in tunnels and other underground openings. Installed in existing inclinometer casings to automate readings. Inserted into small diameter pipe and installed directly into boreholes. A shape array is a chain of rigid segments connected by flexible joints. The joints are designed to resist twist but allow the segments to tilt in any direction. Each segment is instrumented with three orthogonally mounted tilt sensors and a microprocessor. The microprocessor calculates the XYZ position of the segment based on length of the segment and measurements from the tilt sensors. The overall shape of the array is found by cumulating the XYZ positions of the connected segments. Initial measurements serve as a baseline. Subsequent measurements, obtained at regular intervals, are compared to the baseline. Changes indicate that deformation has occurred and reveal the direction and magnitude of deformation. Shape array measurements are forwarded to GeoCloud, GEO’s automated monitoring platform. 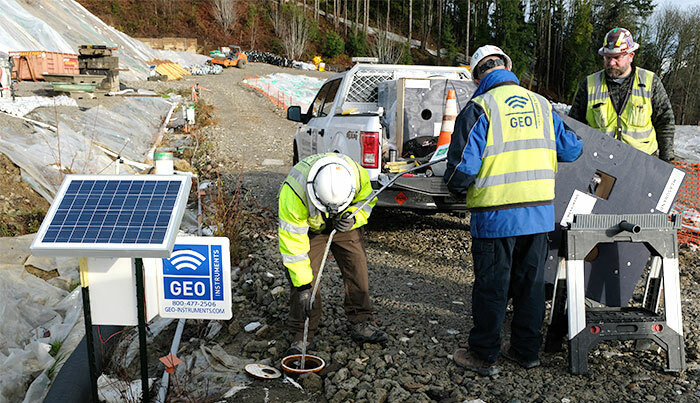 GeoCloud processes the measurements, checks for alarms, and posts plots and planviews on the project website 24/7. Sensors: MEMS accelerometers for tilt. Thermistors for temperature. Tilt Range: 360,° if not constrained. Tilt Resolution: ± 2 arc sec. Array Accuracy: ± 1.5 mm (0.06 inch) for a 32m (105 ft) array, relative to its starting shape. Array Precision: ± 0.5 mm for a 32m array with half-meter segments (0.02 inch for a 105 ft array), proven in long term tests. Segment Length: 0.5 m ( 1.64 ft ) for vertical arrays. 1 m (3.28 ft ) for horizontal arrays. Array Length: As needed, up to 490 feet (150 m). Reading Rate: A 32 m (105 ft) shape array can be read in approximately 10 seconds, assuming the typical sampling and averaging of 1000 readings per sensor.